Infographic: Ten options for negative emissions. By Rosamund Pearce for Carbon Brief. The Paris Agreement, adopted at the COP21 climate talks in December, sets out a global aim to limit average global surface temperatures to “well below 2C” above pre-industrial levels. It adds that there should be “efforts” to limit it to 1.5C. But as countries across the world move towards signing and ratifying the agreement, there remains the key question of how these ambitious targets can be met. A study published last year warned that all the scenarios for keeping global temperature rise to 2C require “negative emissions” – removing CO2 from the atmosphere and storing it on land, underground or in the oceans. Although plenty of negative emissions technologies have been proposed, none are ready to be rolled out around the world, or, in some cases, even demonstrated to work at scale. Kicking off a week-long series on negative emissions technologies (NETs), Carbon Brief takes a look at the many and varied options. Tomorrow, we will publish the views of a wide range of experts who have examined the feasibility of NETs. NETs take more CO2 out of the atmosphere than they put in. No one single technology can solve climate change, but many have been proposed that could contribute to reducing atmospheric CO2. Some consider the notion to be a form of geoengineering, and sometimes refer to it as “CDR” (carbon dioxide removal). Afforestation means planting trees where there were previously none. Reforestation means restoring areas where the trees have been cut down or degraded. Because trees take up CO2 from the atmosphere as they grow, planting more trees means boosting how much CO2 forests absorb and store. As a method of removing CO2 from the atmosphere, this is one of the most feasible options, although it still has drawbacks and uncertainties. Reforestation is almost universally desirable in its own right, particularly if it means re-planting native trees, and is already widely recognised and used to tackle climate change. Many countries are already practising it, such as Brazil, which has pledged to restore 12m hectares of forest. The UN’s Clean Development Mechanism provides a financial incentive for countries to increase their forest stocks. Estimates suggest that afforestation and reforestation can sequester CO2 at a rate of 3.7 tonnes per hectare per year, and comes with an associated cost of $20-100 per tonne. One potential obstacle to afforestation is land availability and suitability. This depends on a range of factors, including global population, diet, the efficiency and intensity of agriculture, and rising competition from bioenergy. Planting vast areas of forests could also cause complex changes in cloud cover, reflectivity, and the soil-water balance. All of these could also have an impact on the Earth’s climate. Biochar is the name given to charcoal that is added to soils rather than burned as a fuel. The charcoal is produced by burning biomass, such as wood, crop wastes and manure, while cutting off the supply of oxygen. This process is known as pyrolysis. The carbon in the resulting biochar is very slow to break down. This means the carbon it absorbed from the atmosphere while it was mere biomass is locked up for – potentially – hundreds or even thousands of years. Making and using biochar can serve several purposes in addition to sequestering carbon. Adding it to soils can improve its fertility – acting as a slow-release sponge for water and nutrients – and boost crop yields The most famous example of this is the Terra Preta (“black earth”) soils in Brazil, which get their name from the charcoal that Native Indians added to the otherwise poor quality soil over 2,500 years ago. Other benefits include biochar being a convenient way of disposing of agricultural wastes, and producing heat and biofuels as by-products during pyrolysis. Biochar has also recently been mooted as a way of helping trees resist ash dieback. A recent study found that biochar has the potential to sequester up to 4.8bn tonnes of CO2e per year. It has “fewer disadvantages than many negative emissions technologies,” the paper says, with limited need for additional land and water. However, as adding biochar makes soil darker, it reduces its albedo, meaning the land will absorb more of the sun’s energy and warm more rapidly. In addition, one study found that charcoal might not stay in soils as long as scientists think, and instead much of it dissolves and is washed into rivers, wetlands, and eventually the oceans. The UK has its own Biochar Research Centre (UKBRC) based at the University of Edinburgh, which was launched in 2009. Bioenergy with carbon capture and storage – more commonly known by the acronym BECCS – is widely viewed as the negative emissions technology offering the most promise of drawing significant quantities of CO2 out of the atmosphere at the lowest cost. Put simply, BECCS achieves net negative emissions through sequestering underground the emissions resulting from the burning of biomass for power. Negative emissions are achieved because of a “double gain” with the biomass, as it grows, having already drawn CO2 out of the atmosphere before the CCS process begins at the power plant. In the video below, Prof Mike Stephenson, director of science and technology at the British Geological Survey, explains how BECCS produces negative emissions. Over the past decade, as climate scientists has attempted to present scenarios whereby the world manages to limit warming to below 2C, they have tended to include BECCS within their modelling assumptions. For example, in the latest Intergovernmental Panel on Climate Change assessment report published in 2014, 101 of the 116 scenarios that achieved a “likely” chance of staying below 2C relied on BECCS. And 67% of these scenarios said BECCS would represent at least 20% of the world’s primary energy by 2100. A recent study suggests BECCS could be used to sequester around 12bn tonnes of CO2e per year globally. Despite a small handful of demonstration projects in the US, BECCS has yet to be proved at a commercially viable scale. Deploying BECCS at such an epic global scale also leaves many unanswered questions about the implications for land and water use. For example, would harvesting such vast quantities of bioenergy compete with food crops and biodiversity conservation? Also, opinions differ on whether there is enough capacity, and in the right locations, to store captured CO2 underground. Salt marshes, mangroves, and seagrass beds act as natural defences against climate change, capturing CO2 from the atmosphere – even faster than terrestrial forests – and storing it in their leaves, stems and in the soil. Carbon stored in coastal or marine ecosystems is known as ‘blue carbon’. Globally, the destruction of a third of coastal and marine wetlands to make way for houses, ports and other commercial activity is shrinking the size of the ‘blue carbon’ sink. Exposed soils also release CO2, turning coastal ecosystems from net absorbers of greenhouse gases to net sources. Carbon emissions from degraded mangroves, tidal marshes and seagrasses are thought to be equivalent to 3–19% of those produced annually from deforestation, though some large uncertainties still remain. Conserving and restoring coastal ecosystems so that they can continue to draw CO2 out of the air has been suggested as a way to mitigate climate change. Global projects to coordinate research and raise awareness about so called ‘blue carbon’ habitat restoration highlight the many benefits on top of reducing emissions, such as providing nursery grounds for wildlife and offering protection against coastal storms. Plant-based materials can be used in construction, storing carbon and preserving it for as long as the building remains standing. For example, timber and bamboo can be used for structural elements, hemp and wool for insulation, and hemp-lime for walling. These materials provide an alternative to standard construction materials, including steel and concrete, which are typically carbon-intensive to produce. Natural materials have additional benefits, such as the ability to regulate moisture and absorb pollution. Architects are starting to incorporate natural construction materials into their designs. In 2015, seven townhouses made of straw went on the market in Bristol, for instance. However, lack of investment, certification and expertise in the UK are currently obstacles to large-scale deployment. When CO2 dissolves in water it makes carbonic acid, removing CO2 from the air. The reaction explains why rising CO2 levels are making the oceans more acidic. CO2 is not very soluble in water, but the reaction can be enhanced by adding alkali. This provides the inspiration for two related ideas for creating negative CO2 emissions. Two Russian scientists suggest adding strong alkali to clouds to create alkali rain that washes CO2 out of the atmosphere. A second paper says adding “an acoustic influence” could help trigger rainfall. It suggests current global CO2 emissions could be offset by spraying 56m tonnes of potassium hydroxide into clouds across 0.4% of the Earth’s surface. That’s the area of Greenland. The second idea would see large quantities of lime (calcium oxide) added to the ocean. The lime would be made by heating limestone (calcium carbonate), a well-known industrial process. Adding lime to the sea would increase its capacity to absorb CO2, while also part-offsetting ocean acidification. The lime would need to be spread over a wide area to avoid saturating the water. At saturation, limestone would re-form, rendering the effort worse than pointless. One study estimates the costs at a relatively modest $72-159 per tonne of CO2 captured. However, the amount of limestone needed would be very large. To remove a billion tonnes of CO2 from the atmosphere would require roughly 2.5bn tonnes of limestone. The current global coal mining industry produces around 8bn tonnes per year. Adding alkali to clouds or oceans at such large scale is likely to be frowned on under international law. It would also have uncertain environmental impacts. Direct air capture, sometimes referred to as DAC, means sucking CO2 out of the air. It can then be buried underground or used in chemical processes to make anything from plastic to fuel. There are several ways to capture CO2 from air. The most common approach is to pass air over a special liquid. CO2 sticks to this mixture while the rest of the air does not. The mixture is then recycled by releasing the CO2, using heat. Direct capture devices are sometimes likened to artificial trees. Unlike a real forest, they would need little land. It is still an open question whether there would be enough capacity to store all the captured CO2 underground. Estimates suggest direct air capture could sequester all the CO2 currently emitted each year. The barriers to this are practical and financial. The concentration of CO2 in air (0.04%) means it theoretically need many times more energy to capture than the CO2 in a coal plant chimney, where the concentration is around 300 times higher. This would make direct capture costly. Some firms say they will be able to capture CO2 from air for $25 a tonne. Other estimates for capture, storage and regeneration of the capture medium range from $400 to $1,000 per tonne of CO2. Most of the energy needed by direct capture schemes is for separating the CO2 from the capture mixture, usually by heating. This energy could come from waste heat or evaporation, rather than electricity. To give a sense of the amount of energy required, it can be compared to the electrical output of power stations. Capturing a billion tonnes of CO2 a year from air would need the energy equivalent of 16 gigawatts (GW) of power plants running 24/7, if the system was perfectly efficient. This is impossible. Under more realistic assumptions, energy equivalent to the output of around 500GW of nuclear or 1,200GW of onshore wind would be needed. To put this in perspective, there is 345GW of nuclear and 432GW of wind power capacity around the world today. Just like land plants, marine plants absorb CO2 as they photosynthesise. Artificially increasing the rate at which tiny microscopic plants photosynthesise could, in theory, accelerate the removal of atmospheric CO2 and slow the pace of climate change. One idea is to inject the nutrient iron into parts of the ocean where it is currently lacking, triggering a “bloom” of microscopic plants called phytoplankton. As CO2 is removed from the surface ocean, more can enter from the air above it. And when the plants die, they fall to the bottom of the ocean and lock carbon away in the sediment for hundreds or thousands of years. Other studies suggest fertilising the ocean with nitrogen or pumping nutrient-rich, deep water into the nutrient-depleted surface ocean could do a similar job in terms of stimulating plant growth. As well as drawing down CO2, it’s thought ocean fertilisation could increase the amount of dimethyl sulphide marine organisms release, altering the reflectivity of clouds and potentially slowing temperature rise that way, too. While private companies and research organisations have carried out a number of trials, big questions remain about the huge scale of ocean fertilisation required, the cost, regulation under international law and the possible unintended consequences of interfering with the natural marine carbon cycle. Natural rock weathering absorbs around 3% of global fossil fuel emissions. The process begins with rain, which is usually slightly acidic having absorbed CO2 from the atmosphere on its journey to the ground. The acidic rain reacts with the rocks and soils it lands on, gradually breaking them down and forming bicarbonate in the process. Eventually, this bicarbonate washes into the oceans, where the carbon is locked up in the sea floor. Enhanced weathering ramps up this process. Pulverising rocks bypasses the slow weathering action, and spreading the resulting powder on large areas of agricultural land makes use of microbes in the soil to speed up the chemical reactions. At the same time, adding minerals to the soil boosts nutrient levels in the soil, providing a benefit for crops. The powder can also be spread directly onto the ocean surface. One of the by-products of this process is to make water more alkaline, thus enhanced weathering has an additional benefit of partially counteracting ocean acidification. According to one paper, enhanced weathering could be used to sequester up to 3.7bn tonnes of CO2eq per year globally. Closer to home, another paper says the UK has “substantial” resources of rock that are suitable for enhanced weathering, and calculates that the UK could capture a total of 430bn tonnes of CO2 at a cost of between £15 and £361 per tonne. Enhanced weathering is a research focus of the Oxford Geoengineering Programme, and the University of Sheffield recently announced plans for a new £10m Leverhulme Centre for Climate Change Mitigation to develop and test enhanced weathering techniques. 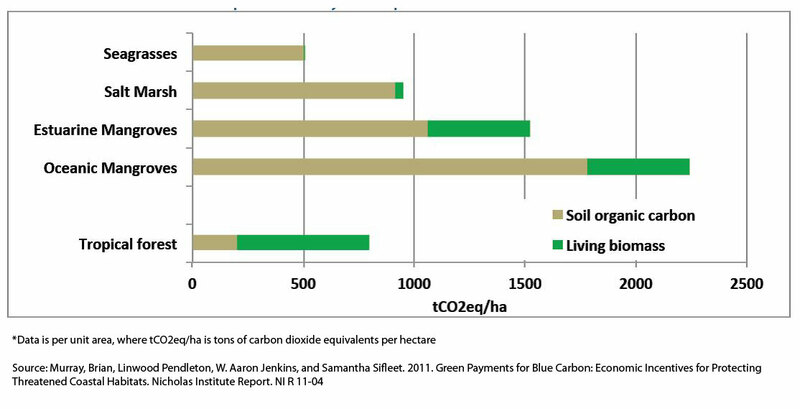 Modern farming methods, such as intensive ploughing, crop burning and the application of industrial fertilisers, have led to huge amounts of carbon in the soil being oxidised when exposed to the air and entering the atmosphere as CO2. Advocates of soil carbon sequestration propose that making some fairly simple changes to farming methods could reverse this process and return agricultural soils to being carbon sinks. Since the start of the Industrial Revolution, scientists have estimated that converting natural ecosystems into farmland has released 50-100bn tonnes of carbon from the soil into the atmosphere. However, through measures such as grassland restoration and the creation of wetlands and ponds, large amounts of carbon in the atmosphere could be sequestered, even exceeding the earlier carbon that had been lost. Earlier this year, scientists published a paper arguing that Brazil could increase its beef production at the same time as reducing emissions through the use of soil carbon sequestration. One negative aspect of soil carbon sequestration is that scientists are still uncertain how soils will react to a warming world, particularly in areas where water supplies might be at risk. Top infographic: Ten options for negative emissions. Credit: Rosamund Pearce for Carbon Brief.